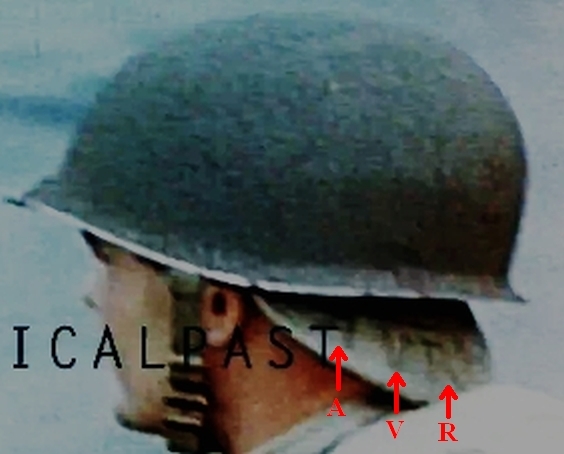 The bill of this soldier’s cap seems to have “AVRA” printed on it. See screenshots below, with additional reasoning, for what appears to be “AVRAM” written on the bill of the soldier’s cap. There are several indicators that the soldier in this video is, in all likelihood, Gunnery Sergeant (GySgt) Ben G. Avram. UPDATE (10/25/2015): Ben Avram’s son, George Avram, confirmed that this is his father. Ben George Avram: Jan 24, 1010 – June 9, 1999; USMC Apr 25, 1939 through October 18, 1945. 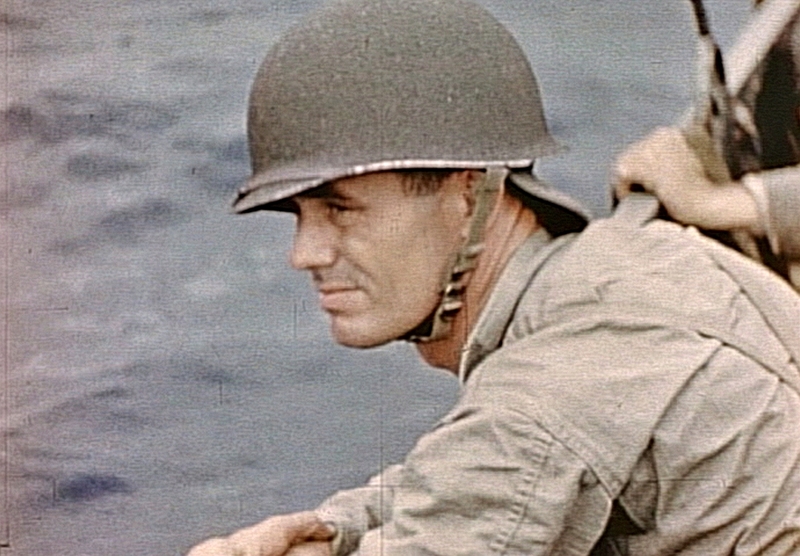 1) The video description, ” LCM (Landing Craft Mechanized) loaded with Marines of the 5th Marine Division underway towards the beach”, indicates that this is footage of the 5th Marine Division AND, according to The Spearhead (page 259), GySgt Ben G. Avram was part of the 28th Regiment of the 5th Marines. 2) According to The Spearhead, there was only one soldier in the 5th Marine Division during WWII that had a last name starting with “Avra” – GySgt Ben G. Avram. According to page 193 of The Spearhead – The World War II History of the 5th Marine Division, Ben G. Avram was wounded in action (WIA). He also received a Bronze Star medal. This a screenshot from a portion of the previous video. 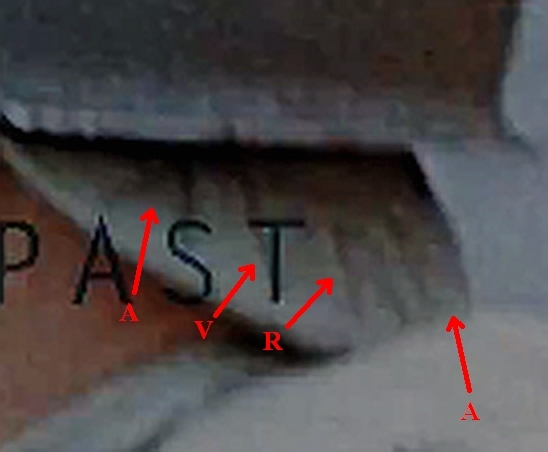 It appears that the entire video (see above), from which the previous footage is taken, was shot from inside the Higgins boat that Ben Avram was in on the way to the shores of Iwo Jima. 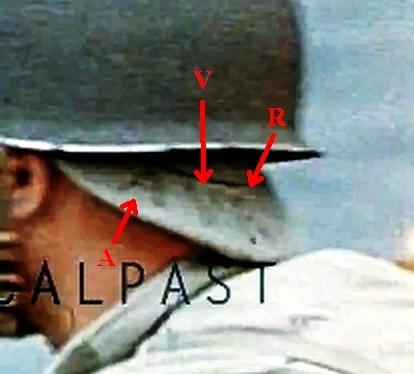 After very close examination using an imaging application to vary contrast, gamma, saturation and sharpness, the writing on the bill of the soldier’s cap does seem to be “AVRA”. Of all of the soldier’s in the 5th Marine Division during WWII, only the names Avram and Havreburg contain “AVR”. The name on the cap is definitely not Havreburg.